Tutorial 74 takes the program created in tutorial 71 and explains how, if two sequential losing trades occur, to introduces a pause for a specified number of minutes when the strategy does not take any new trades. The original strategy, created in tutorial 71, is a simple breakout strategy together with a target, stop and trailing stop. 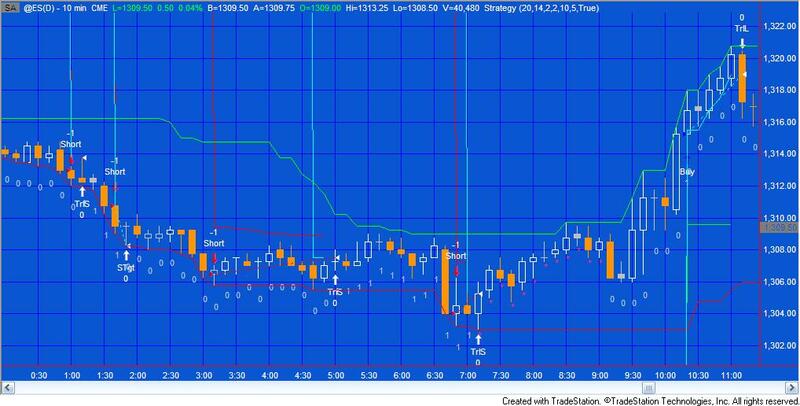 The target and the stop are based on a multiple of the average true range (ATR). The program works by incrementing a counter each time a losing trade occurs. If a winning or break even trade occurs the counter is reset to zero. Once two sequential losing trades occur the program takes the time of the current bar and adds 120 minutes. This time may be the next day, and the program employs an algorithm to detect this. After this time is elapsed the program is able to enter new trades, provided the other strategy conditions are satisfied. In the video I show how to use drawing tools to help debug the program. I also show how to make the number of sequential losing trades allowed before the strategy pauses, and the number of minutes the strategy pauses for, into user inputs. You may wish to add a strategy ‘pause’ for a different reason than a number of sequential losing trades and hopefully this tutorial will give you some ideas about how this could be achieved. Please note that this strategy does not have entry bar protection. This is a subject that I will probably cover in a future tutorial. Gold Pass members are eligible for a 20% discount off this price. The program was written in TradeStation 9.0. If you need it for an earlier version of TradeStation, please let me know.